This is an absolutely cracking opener to series 5 in my opinion and in terms of humour it is jam-packed full of one liners. Arthur & Terry are off the manor with the hapless Arnie in tow and are mixing with some very dodgy boating gentry. A big clue on the filming date for this one - as Arthur walks into the newsagent at the start you see some newspapers all about the death of David A. Kennedy on April 25th 1984. Some great lines from Arthur: "Oh my gawd, it's the bl*ody Mary Celeste!" / "Any danger of another medicinal my dear?" and of course from Arnie: "Is he trying to stripe us up or what?" / "Listen mate, no offence, but but don't you reckon you oughtta bung us back Arfur's bit'a poke?" / "I'm a bit kettled(?) meself" / "Tel, have a look, it's Captain Bird's Eye!" 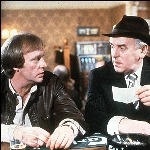 / "And you was gonna bung me 20 sovs for the use my van, you old scallywag" and of course possibily the most memorable line from Minder ever "It's the river filth!". 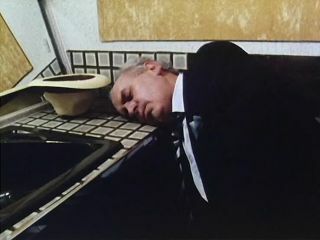 George Cole is great as both the drunk and hungover Arthur on the boat in this one and is very funny to watch. For me, Arthur & Arnie steal the show in the episode. To me the ending seems to be a little confused though, after the excitement of the boat chase, it is picking bags on the sand which is ok but then Chisholm's reappearance and inflatable accident in the Winchester and subsequent running away from the Winchester all seem a bit rushed. Spot on jno - this is my favourite Minder episode. Arthur is on top form in this one, as is Arnie - he was very under used in my view, as was Des. Plenty of great scenes and quotes.... "it's the river filth" & "the VAT man in a boat?" being the obvious classics. Other great moments are Arthur referring to Arnie as "Bird Brain", a drunken Arthur telling the others to be "Up with the sparrows fart", being out of his social depth on the Pink Gins in the pub, Terry and Arnies reaction when Penny says to Arthur "Boats can be tricky for the older gentleman" and Dave having to microwave the tobacco before selling it ... to Arthur Fowler! GC is a master class as a drunk and his hangover on the boat is superb. By the way jno - Arnie says "I'm cattled" as in cattle trucked ...... I wont go into detail!! Love this episode...when Arthur wakes up on the boat with a hangover, it's just a brilliant moment..."Blood Mary Celeste"!!! It's my favourite episode too! As jno mentioned Arnie's line "Tel, have a look, it's Captain Bird's Eye" is one of my favourites. Also when Terry and Arnie sign Arthur's receipt as Adolf Hitler and Mickey Mouse. "I'm a bit kettled(?) meself"
Cheers arnie/felix for 'cattled' - not one I have heard much but certainly one I shall take forward with next time I am ******. This is one of the few where the team venture off the manor - but this one most definitely works. Arnie's clobber also somewhat noteworthy in terms of 80s wide boy fashion. Arthur - "I've got a punter for these, with his tongue hanging out"
Arthur - "Church on the right, pub on the left"
Dave - "You've just handed over 2 and a half grand to Frank Sinatra and Adolf Hitler"
Arthur - "Part of the tactics of marriage, Mr Chisholm"
Arthur - "What about poor Arthur Daley - this has been a right unmitigated"
Arnie - "Its the River Filth!" Arnie - "so how much duty free do we get?" Terry - "Thanks Arthur - you've given me my big chance.."
On last week again and definitely up there as one of the best ever. In fact, as other posters have said, the script is brilliant throughout, it crackles along. But the thing I loved the most was the laughter of Terry and Arnie when Arthur ventures out onto the mud to help collect the bags of tobacco. To me, the actors are genuinely laughing and loving what they are doing. It sums up to me something that made Minder great. The actors, especially GC and DW, loved working together and, as DW recently remembered at GC's funeral, genuinely got along and laughed all the time. I love this episode too. Very funny when Arthur is trying to collect the bags. In fact all the episodes where Arthur falls over/stroke into something are hilararious. I saw a few minutes of this on ITV4 recently. I watched the bit where Terry and Arnie go to the boat and even though I've seen it loads of time Arnie had me in tears of laughter with his stupid phrases - as described above. He also calls Hawksley "colonel"! Definitely one of the very top. Love the running joke of Commander Hawksly asking Penny repeatedly if she needs to put her oilskins on. Unusual start to the series away from London but it works, thanks to Arthur's seasick scenes, where George shows off his skills as an actor, and the end sequence where Ray and Dennis are wading thru the mud and surely thinking, "We're getting paid to do THIS!" Magic. Arnie is fantastic in this episode. In the scene where he and Terry are asleep in their bunks, he's kipping with his thumb in his mouth like a contented toddler. Such a shame Arnie wasn't used a little more because he brought another layer to the show. "Just because it's all yo ho ho and splice the main brace don't mean you can't get nicked for it"
This is a great episode could have even got an extra half hour out of this one as the ending was all over all too soon, I love Arthur's line I've got a punter with his tongue hanging out one of the best lines ever in my eyes. Arnie was great as well, it's big shame Arnie and Des were not used in more episodes and given more screen time - would have been nice to have seen them in the Ray years as well. One of my favourite Minder episodes (definitely in my top five), I very much like the scenes, where Arthur, Terry & Arnie, go out on the boat, with Commander Hawksly (Moray Watson) and Penny (Sarah Berger). Plenty of laugh out loud moments, in this episode, two memorable scenes - Arthur falling over in the mud (while trying to pick up the bags of smuggled tobacco), and Chisholm's inflatable incident, in the Winchester Club, at the end of the episode. I also like the scenes, re - the stolen football boots, first of all, Arthur (thinking the football boots, are trainers) tries to interest Harry Baily (Anthony Langdon), who soon discovers, that they are football boots, and later on, in the episode (at the Yacht club), Arthur tries to interest Johnny Winstanley (Reginald Marsh), by which time the studs had been removed from the bottom of the boots (by Terry & Arnie), and Arthur was now referring to the boots as non-slip deck shoes. Nice to see, Arthur, Terry & Arnie, away from London, in this episode. Below is a screencap (from Goodbye Sailor) of Sarah Berger as Penny. The bit where Arnie shouts "It's the river filth!" really made me laugh out loud tonight. Best line in the episode. As everyone says, this is a quality episode, filmed during a very pleasant spring of 1984. 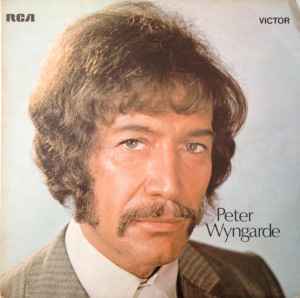 Ray Winstone is good here (the days before he became Ray Winstone). Arthur's malapropism's are excellent (BT being "privateered" and reference to "Nurse Theresa". Does anyone else agree that Arthur seems unusually aggressive in this one? especially towards Terry and Arnie, calling them "ignorant nerks", "clowns" and Arnie a "Birdbrain". I've always thought this since I first saw it on UK Gold in 1995. Even by the high standards of Minder this episode is crammed with great one liners. An all around excellent episode and one of best. I enjoyed it even more the second time. I understand what "having a jimmy" means but what is the origin of the phrase? Is it related somehow to rhyming slang? Noticed a little blooper. Arnie's and Terry's beer glasses where nearly empty then full again in the Winchester. A nice start if this was season 5. Having to go on a boat ride only to find that it wasn't all legit and Arnie tagging along with Terry. It was all good. Another episode I will have to grade as excellent.